Copenhagen style bicycle lanes are being considered by many towns now as they have proven hugely successful across numerous countries in keeping accident and mortality rates down. The City of Melbourne in Australia is considered up there at the forefront of trying to find ways to ensure that every user of the road – pedestrians, cyclists and car drivers – can all be safe and share the same road infrastructure. In 2007, they introduced a new ‘separated lane’ design that was installed along the Northernmost end of Swanston Street, running from Franklin Street to Faraday Street over in Carlton. These bicycle lanes now run alongside the pedestrian footpath and car drivers have to park on the outside of the bicycle lanes. A one metre wide ‘safety island’ separates the bike lane from these parked cars. In many areas the tram system is also active, running in the centre of the road. 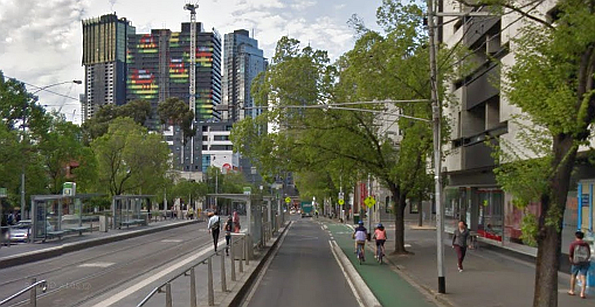 Between 1998 and 2003, there were 11 serious accidents documented that involved cyclists and cars along this part of Swanston Street in Melbourne and many more minor injuries and accidents happened. When the new bicycle lane system went live, what originally was introduced as a trial quickly became a sensible solution, although there was some automotive chaos that ensued immediately after the road change, notably related to parking. Although we struggled to find exact figures, the accident rate is said to have dramatically reduced. It is commonly known as the ‘Copenhagen’ style of bike lane because the first documented bike lanes of this type were constructed in Denmark’s capital city. This style of bicycle, pedestrian and car separation, now nicknamed ‘Copenhagenization’, has been used successfully across Europe. The wide ‘island’ (essentially a raised kerb) helps to prevent cyclists from colliding with opened car doors or car occupants who have just exited their cars. It also provides important visual clues as to the proper road positioning for each road user, something that we, as cyclists, are all too aware often gets abused. Is this the way forward for town cycling? Bike separated lanes partition motorists from cyclists, allowing both to travel more safely on the same road networks and we can’t advocate this enough. We firmly believe that it should be part of any new urban road design structures. With this type of change there is a need for public education though. New methods and systems for our roads mean that drivers and pedestrians can get confused, have longer journeys and hence blame the ‘lycra clad brigade’ for their woes. We have seen it happen before and will doubtless see it again. However, if you experience a Copenhagen style layout from every user’s perspective, which we were lucky enough to do on a recent trip to Melbourne, you can see a modern, almost futuristic infrastructure that includes pedestrian, cyclist, motorcyclist, car driver and tram user in a safe and harmonious layout, albeit for a small percentage of the City’s large area. With the City of Melbourne making such a commitment to encourage sustainable transport models we really do hope that this will be taken on board in many other towns and indeed countries. Amsterdam came up with a simple yet elegant solution for congestion of cycle lanes. In this video, you can see how having straight cycle lanes causes ‘bunching’ at the traffic lights, so to overcome this they added a banana-shaped kerb that allows more people to get closer to the junction while the lights are red. Once the lights change, the people instinctively filter into a normal lane width. It’s interesting to note that this can be used on the opposite side of the road and oncoming bicycles will also filter into a nice, orderly queue too with the appropriate lane markings. Apparently it’s to do with the normal human behaviour pattern of walking in a line. It seems to work well so let’s try to adopt this method where increased bicycle traffic is seen around junctions. Having cycled in Holland quite a lot, I am always surprised at the short timing of the lights. If you are at the back of the larger queues you simply can’t get to the light before it goes red again, so this will doubtless help solve some frustration from that issue. Once again, Holland, like its Scandinavian neighbours, are pushing the boundaries of 2-wheeled pedal transport infrastructure. Does the vehicle traffic have to suffer? Apart from the odd road marking alteration and traffic light relocation, not much else needs to be changed. The biggest selling point is that motor traffic space is not changed at all using this method. Something for Governments to think long and hard about, because minor changes like this can lead to a better overall cycling infrastructure without negative effects for drivers. Rocket propelled bicycle beats a Ferrari! Last week, Francois Gissy strapped rockets to a bicycle and reached 333 km/h (207 mph) in a little under five seconds. On Monday, October 7, 2013 at Interlaken’s airfield there was a new speed record attempt for a rocket-propelled bicycle. The (very short!) track proved challenging but there was a first test run of 175 km/h. Not bad at all. With the 2013 record standing at 263 km/h there was still a way to go though. The incredible speed of 285 km/h was finally reached in just 6.7 seconds. The quarter-mile was covered in about 7.3 seconds too. Wow, on bike tyres and brakes that’s some achievement! David Veilleux went into his first Critérium du Dauphine with the hope of a good performance, while supporting his team-mates. He came out with a very impressive haul of one stage win, three days in yellow and a top spot on Europcar’s Tour de France team.